Forked from the Azureus open source project created in 2003, BiglyBT continues its development, and keeps all the features you've loved. If you are already using Azureus or Vuze, you'll have the option to copy and migrate the config settings, downloads, and plugins. P.S. sorry for the huge screenshots, but no time to resize them right now (just linking to the original website screenshots). BiglyBT is not a new program, it is just a fork of Azureus/Vuze without the ads, the bloat and the bundled installers, it is what Azureus had used to be before it became Vuze. 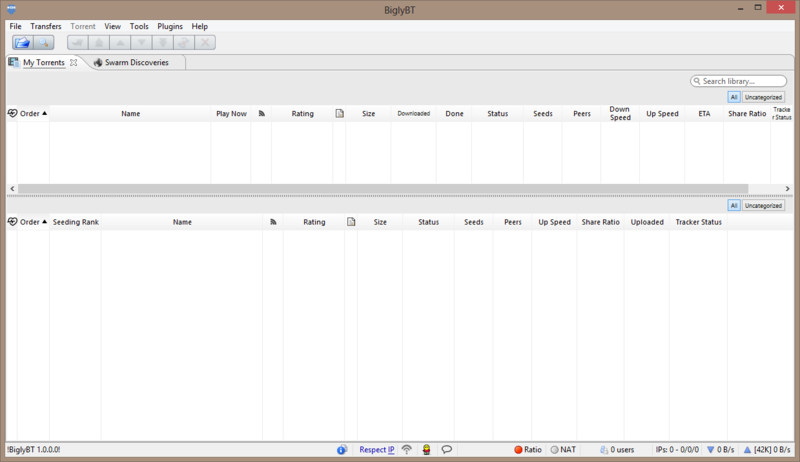 I have tested almost all torrent clients for Windows (without BitLord and some more Vuze adware clones) and for me BiglyBT is the most powerful and the most customizable one. 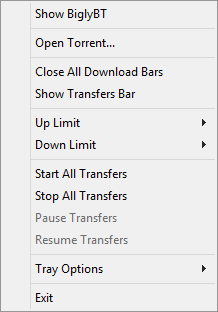 I consider myself an experienced torrent user yet I cannot say I understand all options BiglyBT provides. Customizing the program to one's liking requires some efforts. BiglyBT is not appropriate for beginners. If the latest Java version is not installed during the installation BiglyBT will try to download and install it (the process can be cancelled). 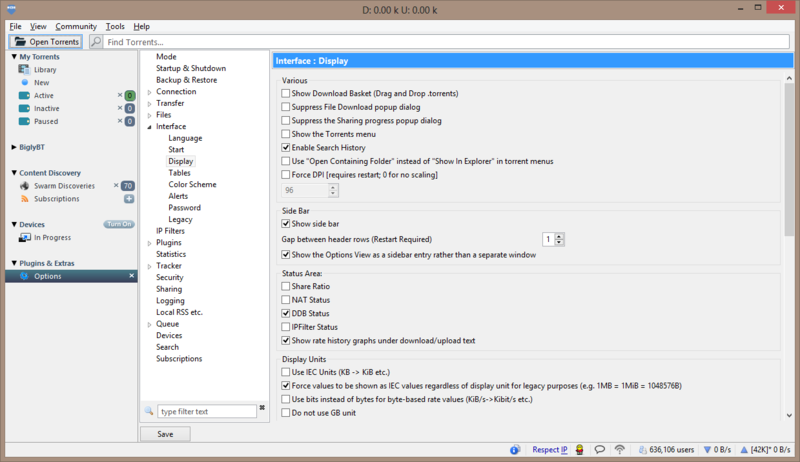 During the installation one can choose between two UI styles- Sidebar and Tabbed. If Sidebar style is installed later one cannot switch to Tabbed style in options (and vice versa), to use Tabbed style one will have to install the program again. 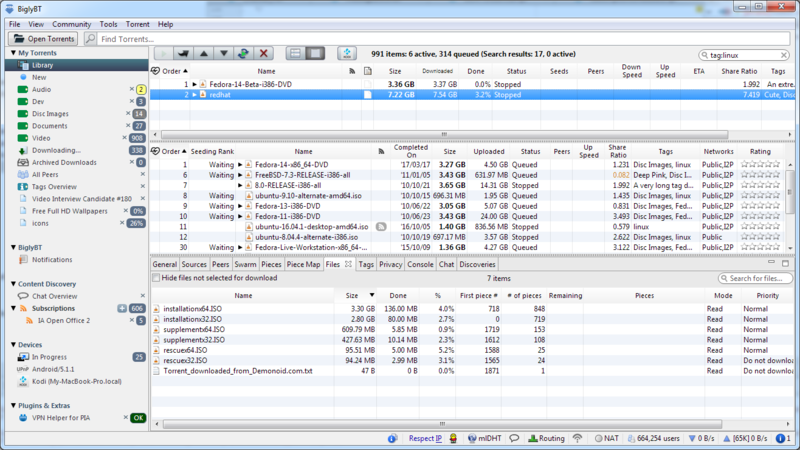 Even without the Vuze bloat BiglyBT is a heavy program, even without any torrents loaded it uses about 250-300 MB of RAM. The full installers of BiglyBT version 1.0.0.0 provided for download at BiglyBT website and at GitHub have the same version number but are different, for me this is sloppiness. Compared to the cute icon Azureus once had for me the BiglyBT icon is dull. 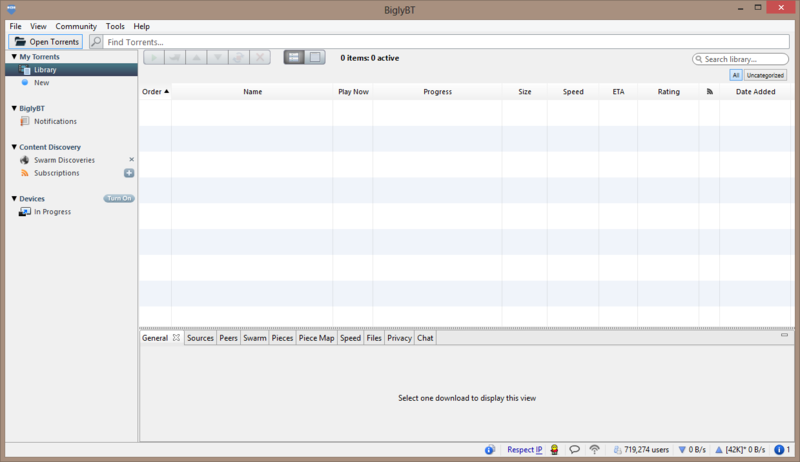 I don't think that there will ever be a native portable version of BiglyBT. Losing its two major developers Vuze is most likely dead (a good riddance- Vuze should have never existed). and thus again destroyed my work. For me this service is not reliable. Last edited by smaragdus on Thu Apr 12, 2018 6:30 am, edited 4 times in total. Looks decent. Pity it requires Java. I uninstalled it long ago as it's one less thing to have to keep up to date (in particular for its frequent browser vulnerabilities, though those plugins can be disabled). Specular wrote: Pity it requires Java. I uninstalled it long ago as it's one less thing to have to keep up to date (in particular for its frequent browser vulnerabilities, though those plugins can be disabled). author of https://www.ghacks.net/2017/08/05/biglybt-new-vuze-based-torrent-client-without-ads/ wrote: Note: BiglyBT requires Java. It comes with an integrated Java Runtime Environment so that Java does not need to be installed globally on the system to use the torrent client. Last edited by Midas on Mon Apr 16, 2018 3:14 am, edited 1 time in total. BiglyBT at version 1.5.0.0, history. There are lots of changes but I have not tested this version so far, I have Java 8 and when I started the installation BiglyBT automatically started to download Java 9, without any prompts, for me such behaviour is unacceptable. Yeah that's kind of a big deal. I can think of a lot of reasons this is a really bad idea. Even putting aside all the other questions of security, bandwidth, network policy, etc., you might have an earlier Java version running software that a fresh install will break. I've downloaded, installed (using "Revo Uninstaller") and tested "BiglyBT" and cannot recommend this. Sure thing is it has loads of options. But it's sooo heavy, it's slow, it's bloated and was a disapointment to me. Whenever i've decided to remove it using "Revo", i went into some real trouble. it was unable to load windows 10. Some wood to stoke the flames? So, to clarify: I’m running a laptop that has an operating system called 'Chrome OS', which is mostly just Google’s Chrome browser and a little bit of Linux, and now I’m installing 'real' Linux applications inside a virtual machine on top of Chrome OS, and most of those applications are built entirely with Chrome-derived technologies. Interesting. The article points out an Electron competitor called Proton Native. Some of you might be saying that you could do it in Electron. It's a good tool, but it brings in a lot of overhead, running a full webbrowser to manage a small GUI, while Proton Native can do the same, using native tools, with a smaller size and with less resource usage. Thanks. It takes a pro to cut through the fluff and discover potential avenues for evolution. Proton Native does indeed look promising to my layman eyes. @MidasGood programming is in decline. It's certainly the case that rapid development produces lower quality code. It's also been the case that cross-platform tools are generally bulky and not very efficient. What's new is that every very basic tools are coming out that require really massive system resources, where even systems with 8 GIGs of RAM are going to seem small. If I could just figure out a way to force Electron to work with a single, low-priority process with 20 megs of memory, I'd do it. It might be a different conversation if Electron programs naturally held a host of amazing tools and features. After all, it's basically and entire copy of Google Chrome, a program that's had a massive amount of time and energy put into it. Yet I've been underwhelmed by Electron-based offerings apart from the Atom code editor.